In between meetings at work last week I checked my phone to see I had 21 new texts (my wife even emailed me), all of which alerted me to the Cespedes/Lester trade and wanted my reaction. As a Bay-area transplant in NYC, my allegiance to the A’s is well-known. I had a million thoughts at once, including the content of the meeting that just finished – how to teach kids to be better active listeners (for those who don’t know, I am a school teacher by day). I was shocked and confused – the A’s are on a great run and Cespedes has been instrumental in their success. Why would they trade him? 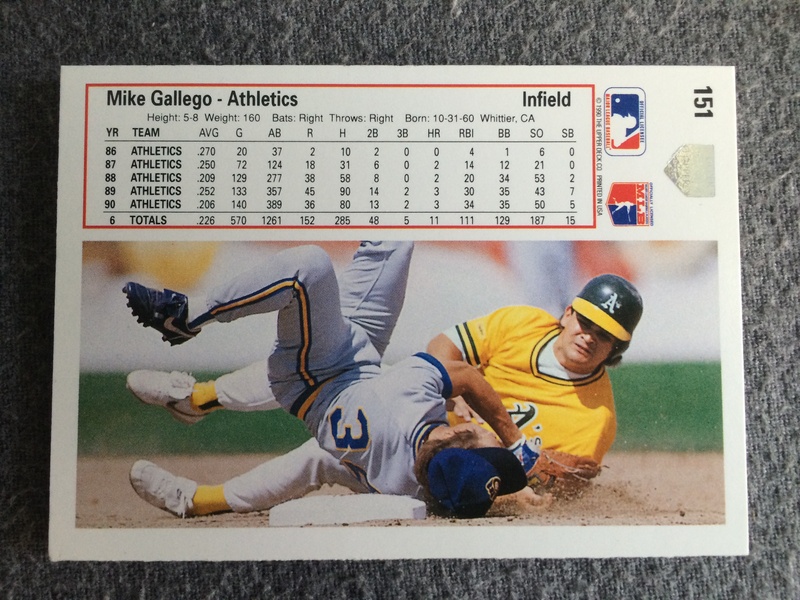 In the time before my next meeting, I began to understand what the A’s were trying to do. They obviously wanted to strengthen their pitching if they were going to get through the Tigers and possibly win the World Series. I knew they weren’t going to send any more prospects away or else their farm system would become depleted. So, the only thing left to give up would be a big bat: Cespedes. I understand what Billy Beane was thinking, but I don’t have to like it. Cespedes was a fan favorite and was an integral part of the A’s playoff runs in the past two years. He is also a bonafide star that put the A’s on the map again by winning the Home Run Derby in consecutive years and helped improve (pathetic) home attendance since he joined the team. According to an article on Athletics Nation Cespedes has a 2.3 WAR on the year, and Sam Fuld (who the A’s reacquired from the Twins) also has a 2.3 WAR on the year. Huh? This didn’t make sense – how can Cespedes have similar numbers to that guy nobody knows? Then I realize that being a star and a recognizable name skewed Cespedes’ average numbers. However, despite this statistic it still doesn’t measure heart, or the chemistry Cespedes had with the A’s. A team chemistry that shouldn’t have been messed with. Sure, the A’s got Jonny Gomes back (also a fan favorite), and has been a proven leader in the locker room, but can he fill the Cespedes void? Only time will tell. I realize that it’s rare for a player to remain on one team for their career (especially if they’re playing for A’s), but I’m still left with an empty feeling. Maybe a World Series run will help? 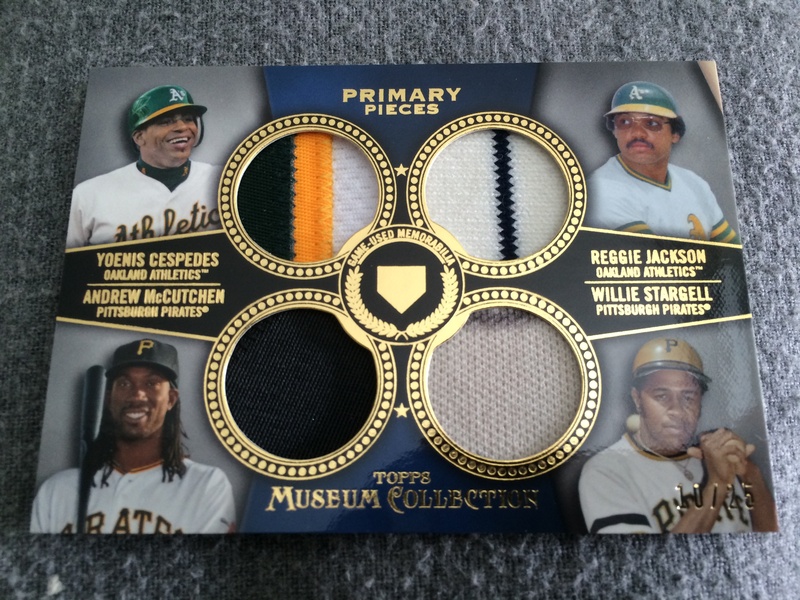 The card I chose to feature today is a 2013 Topps Museum Collection Primary Pieces Quad Relic. It features two legends and two future legends, and it’s hands down my favorite Cespedes card. A few people have asked me why I collect Curtis Granderson cards if I’m an A’s fan. Well, imagine being a student at Abraham Lincoln High School in Brooklyn. You arrive at your classroom, unpack your bag, and stand haphazardly for the Pledge of Allegiance. All of a sudden, a voice echoes through the speaker in the classroom, and it’s not the voice you’re familiar with. No, it’s the voice of Curtis Granderson, who was the starting outfielder for the New York Yankees. Granderson was at the high school to celebrate Jackie Robinson Day, and to see the athletic facilities his foundation help build for the school. If this wasn’t enough, Granderson took a select group of students to see the movie, 42, when it was released back in April of 2013. There are countless athletes who have visited schools and have done good deeds, but I can’t think of many athletes who would fly up from Florida on their day off to take a group of students to the movies. I can’t recall an athlete who refused to get paid by his endorsers so that the money could be used by his foundation. Whenever I watch Granderson being interviewed he is thoughtful and well spoken, and doesn’t bad mouth anyone. It’s no wonder he was voted one of the friendliest players in the game. Living in New York for the past four years I’ve had the pleasure of watching Granderson play for both the Yankees and the Mets. You can tell he works hard, he hustles, and simply plays the game the right way. Of course, this is only one man’s perspective, and it’s a limited perspective at that. However, it’s refreshing to know a player like Granderson exists in any sport let alone baseball where players tend to be selfish, and are driven solely by the money. While I’ll always be an A’s fan, I’m very proud to be a fan of Curtis Granderson, and collect his cards. Did I mention he’s also authored a children’s book? Check this out. Shown above are three of my favorite Curtis Granderson cards. 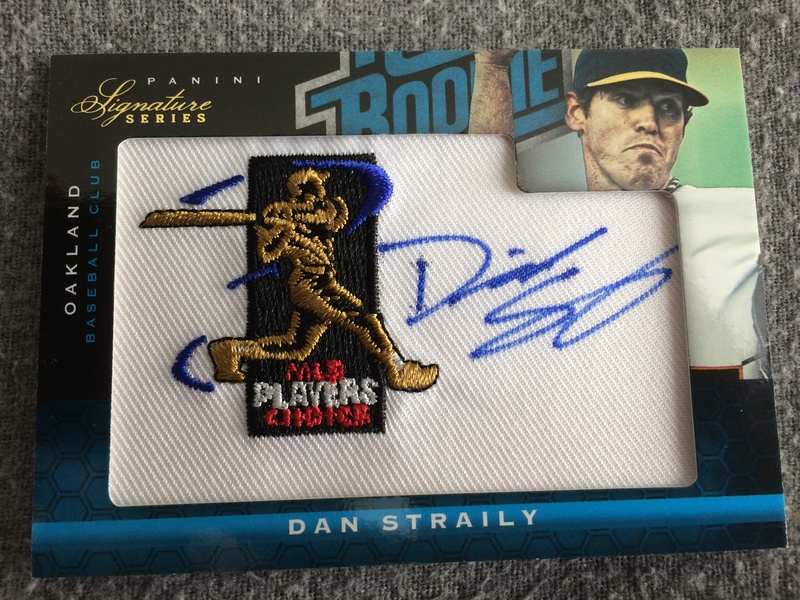 An 2009 Upper Deck SP Legendary Cuts card that resembles a postage stamp. 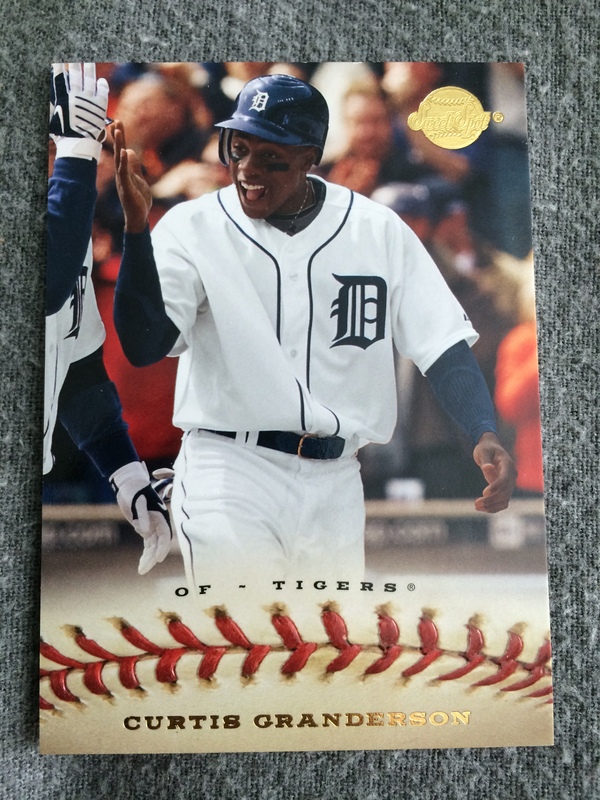 An 2009 Upper Deck Sweet Spots card that show that shows lighter site of Granderson. I’m a sucker for that baseball with the raised stitches at the bottom. Finally, a 2012 Bowman Gold Border card. 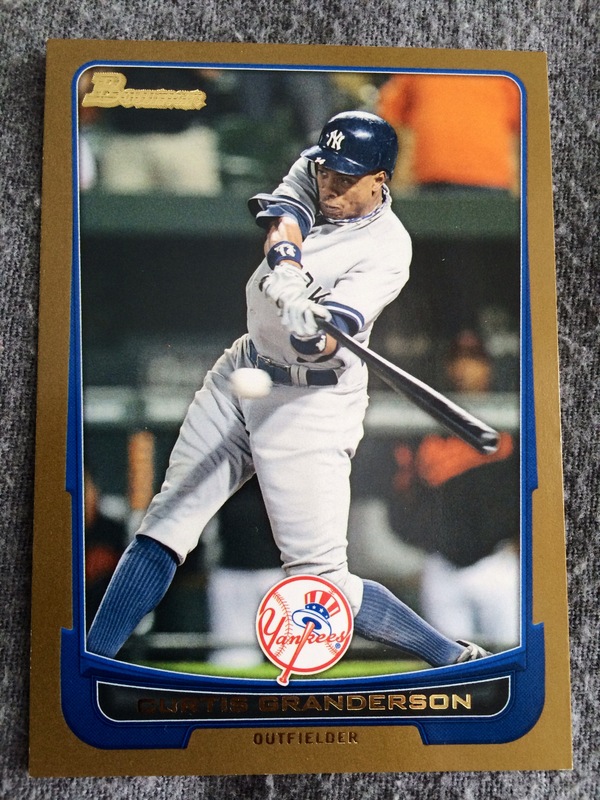 It’s simple, clean, and it’s one of the few cards that shows Granderson in mid swing. 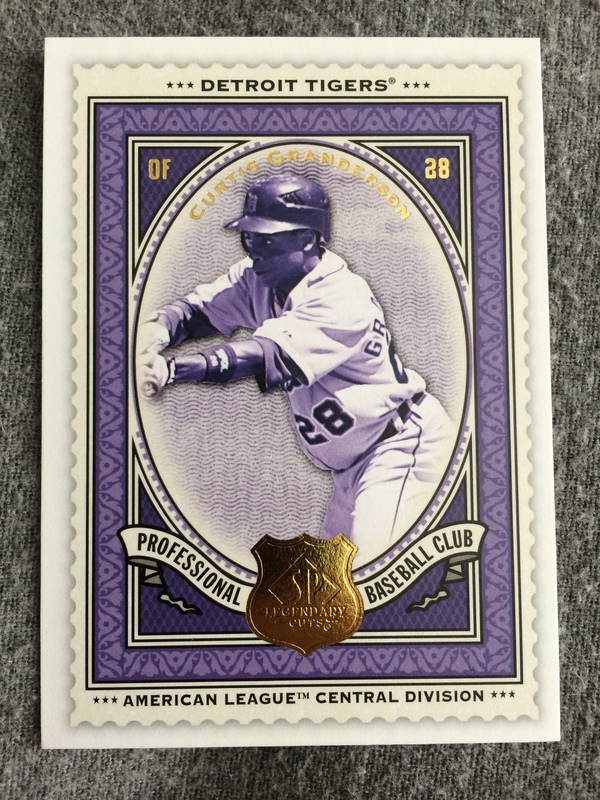 You can check out the rest of my Curtis Granderson PC by clicking here or on the tab above. 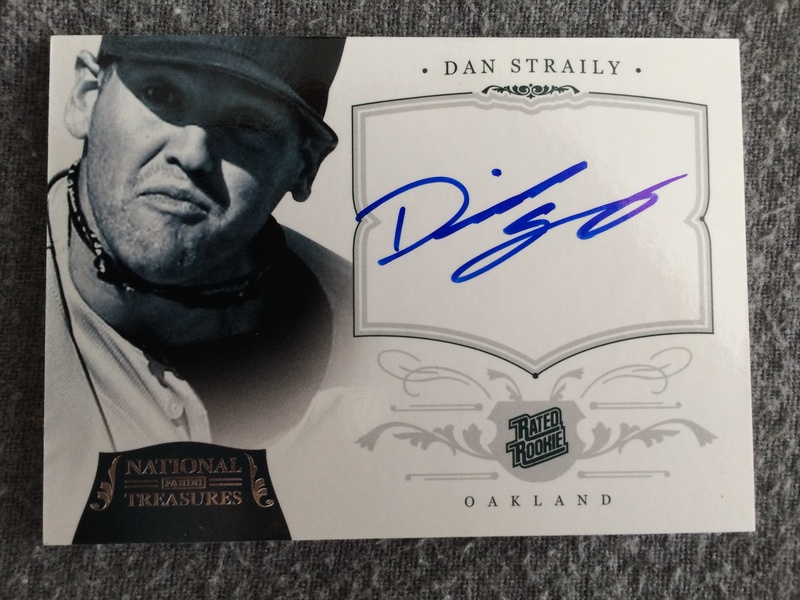 The A’s signed Dan Straily in 2009, and he instantly became one of my favorite players in their organization. I remember reading he was from a small town in Oregon, and never had any training on proper pitching mechanics until after his first year in college, which I always found impressive. Straily was a promising young prospect, and came through the A’s farm system rather quickly. Before his call up on August 2, 2012 he was leading both the minor and major leagues in strikeouts (175). Straily made his MLB debut on August 3, 2012 against the Toronto Blue Jays and didn’t disappoint. He earned a no decision giving up an earned run on five hits, and striking out five. It’s no wonder that when I got back into card collecting in 2012 these were the first two autographed cards I acquired. A 2012 Panini Signature Series auto relic, and a 2012 Panini National Treasures auto. Straily pitched well for the A’s for the rest of the 2012 regular season and into the playoffs. He was huge asset to the club in 2013, compiling a 10-8 record with a 3.96 ERA , 124 strikeouts. However in 2014, Straily struggled from the start of the season. Eventually he was optioned to AAA where he was dealt to the Cubs in the Samardzija/Hammel deal. The trade was bittersweet for me. The A’s were gaining a couple of great pitchers (okay, maybe one great pitcher), and they were giving up one of my favorite players in the organization. On the bright side, I’m excited for Straily to get a fresh start with a different organization. In the next couple of years I believe the Cubs will be contenders, and I hope Straily is able to part of that. So far, it’s not looking so good. He’s currently sporting an 0-3 record with a 5.85 era, but he does have 15 strikeouts in his last two games. No matter what happens he will always be one of my favorite players to play in the organization. I wish him the very best with the Cubs. 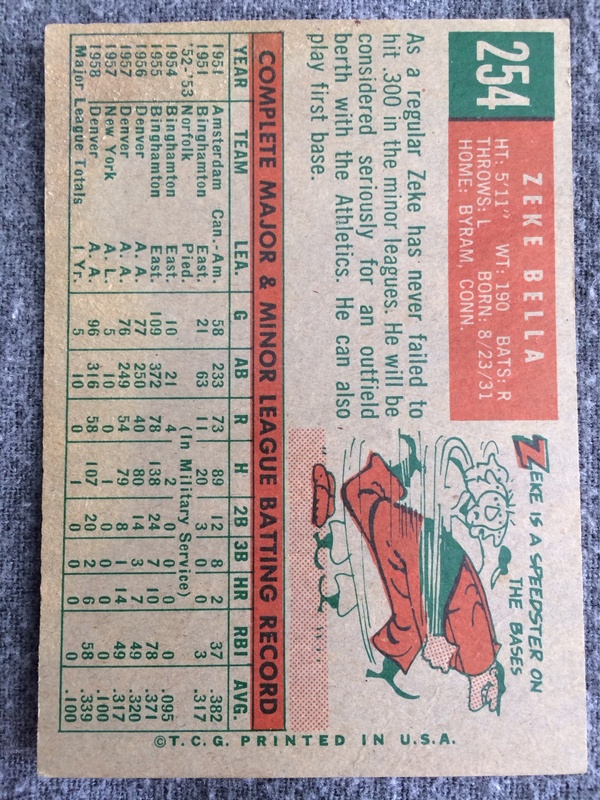 I was recently given this 1959 Topps John “Zeke” Bella card by a friend. Zeke who? I had no clue who he was either. I found out that he played roughly two years in the majors from 1957 to 1959. He was originally a Yankee (signed in 1951), but the Korean War took him away from baseball for four years. Upon his return he signed with the Yankees again and was called up in 1957. In his two years with the team he didn’t see much playing time (11 plate appearances) with Mickey Mantle, Elston Howard, and Hank Bauer starting in front of him. 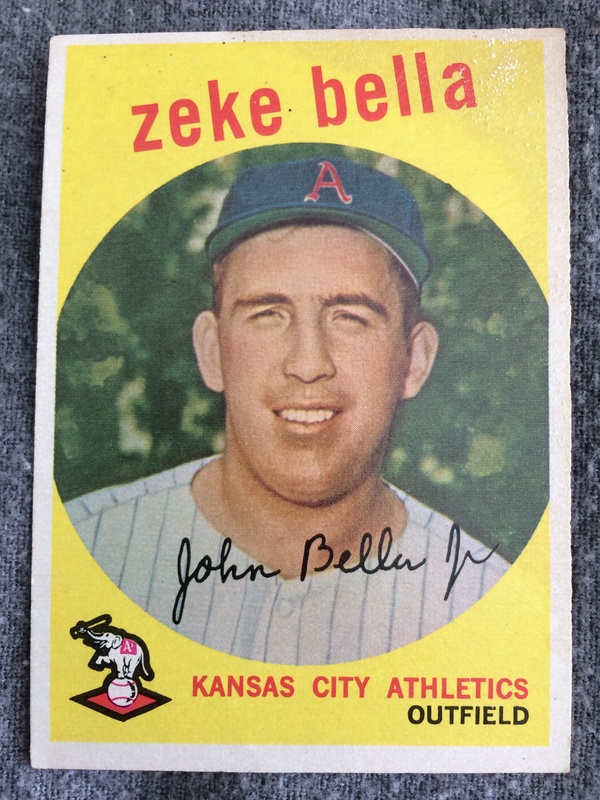 Bella didn’t play in 1958, but in1959 he was traded to the Kansas City Athletics where he had 92 plate appearances. According this baseball card Bella was a speedster on the bases. It’s too bad he didn’t get more opportunities to play. 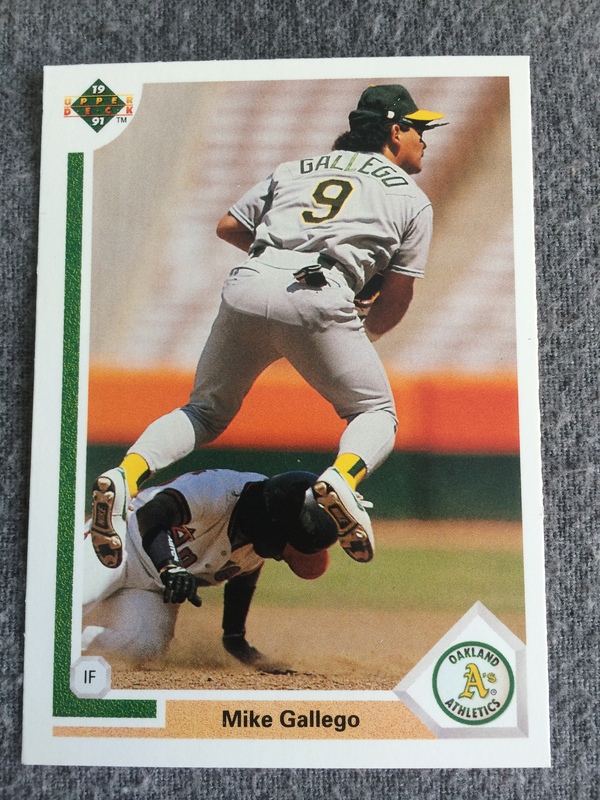 He wound up with one home run and nine rbi’s in his short lived career. In his obituary it was said that his greatest joy was playing for the Yankees. While I’m not a Yankee fan it was nice hearing how happy he was while playing this game, and I’m proud he was able to wear an Athletics uniform.